UPDATE: The exhibit will be on display through the end of May. UPDATE: The exhibit will be up through the end of June. Immediate Release – The National Mall Coalition announced today that the Coalition’s exhibit on the current and future status of the National Mall, one of the country’s iconic landscapes, is up for viewing by visitors to Washington and those from the metro area returning home. The exhibit, National Mall: Stage For Democracy, is located across from Baggage Claim 4, Terminal B, at Ronald Reagan Washington National Airport. The exhibit, National Mall: Stage For Democracy, is located across from Baggage Claim 4, Terminal B, at Ronald Reagan Washington National Airport. It was arranged for display in concert with the Metropolitan Washington Airports Authority as part of the Airports Authority’s Arts Program. Watch a virtual tour of the exhibit here. The exhibit orients viewers about the original design of the nation’s capital by L’Enfant in 1791, the redesign of the Mall in 1901 by the McMillan Commission, as well as major events and activities that have taken place on the Mall. It speaks to a number of critical challenges the Mall faces, including flooding that threatens our national museums and public buildings and the need for an updated plan – the last plan was in 1902 — for the Mall to address future needs. And it asks viewers to consider ideas for a 3rd Century Mall plan: to expand the Mall’s boundaries to accommodate the needs of future generations for new museums and memorials; to enhance public amenities to support the Mall’s modern role as a Stage for American Democracy; and to create environmental solutions to ensure the resiliency of the Mall for the next 100 years and more. Visitors are directed to the nearby airport Information Office to pick up the Coalition’s popular free map and historical guide, National Mall: Stage for Our Democracy. “We’re hoping to excite visitors – including the thousands who will be arriving for events surrounding the Presidential Inauguration – about the visionary heritage of the Mall and the need for us as citizens to be involved in ensuring its future vitality,” said Coalition chair Judy Scott Feldman. 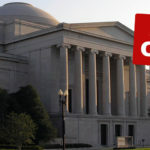 The National Mall Coalition is a nonprofit citizens organization founded in 2000 that engages policy makers, civic groups, and increasingly Americans across the country to advocate long-range planning for the Mall to ensure its continuing role in American democracy. Learn more at nationalmallcoalition.org.